I don’t think you will find an artist that translates their Indigenous heritage and love of surfing more visually than Zachary Bennett-Brook. Tracing his roots back to the Torres Strait Islands, Zachary combines his heritage and surf stoke to create beautifully painted surfboards and fins using a technique and style born while literally waiting for paint to dry. He has produced some stunning pieces and we spoke with him about surfing and how his heritage has influenced his artistic style. I’m a proud Torres Strait Islander man born and raised in Wollongong on the South Coast of NSW, a 1 hour drive South of Sydney. My Torres Strait Islander heritage comes from my mother’s side of the family, her Grandfather was of Torres Strait Islander decent. 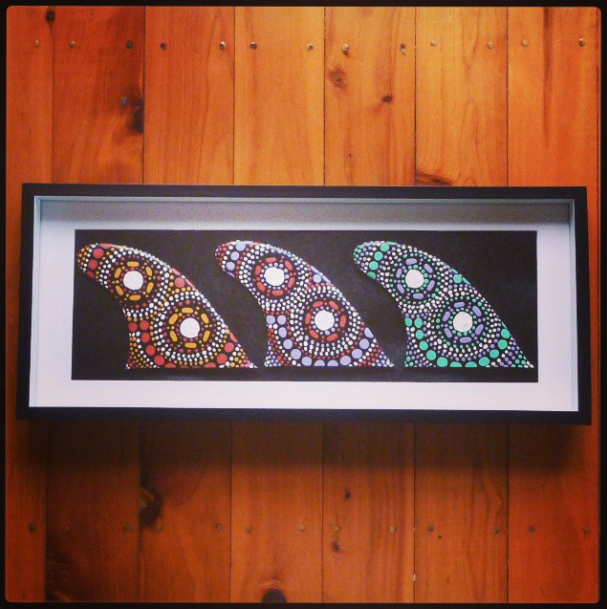 I create artworks, which combine my passion for the ocean and surfing in conjunction with my Indigenous heritage. My artworks are often painted on recycled surfboards and surfboard fins, and a wide range of other materials and objects I use as my canvases. How has surfing influenced you? I have always had a strong connection with the ocean, being Torres Strait Islander we are often know as the saltwater people. From a young age I have been drawn to the ocean and surfing is just another way for me to connect to land and my country. I love nothing more then sliding across ocean hills (waves), which are provided by mother nature. My surfing culture is evident in all my artwork, from the designs and stories I tell within my work to the colours I use. How did you discovered your artist style? 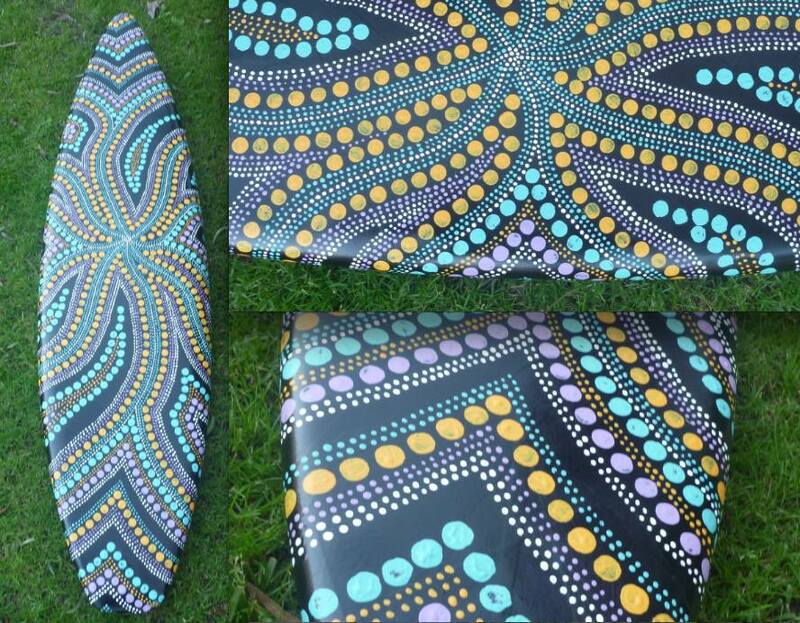 The whole painting on surfboards thing all started when I was doing a commissioned artwork for a local Primary School. I was getting a little impatient waiting for sections of the paint to dry and thought I would start another painting at the same time. I had this old surfboard laying around and thought it would make a great canvas which would allow me to connect my surfing culture with my Indigenous culture, and the rest is history. I shifted from painting on traditional canvases and focused more on painting surfboards, fins and surf related objects. Can you explain your process of painting surfboards and fins…they are beautiful! My creative process changes from artwork to artwork. For example if I was painting on a surfboard depending on the condition of the board I may have to repair or fix the board before the painting process can begin. With damaged surfboards, I often cover them in layers of paper mache, which allows the paint to be absorbed and stick better then straight onto the fiber glass. With many of my artworks I paint the background black first. This allows a nice surface for the paint to stick to as well as allowing the bright colours I use to “pop off” and look aesthetically appealing. Do you have a favorite piece you’ve done and what makes it so special for you? Almost every artwork I finish becomes my new favourite, more so then the last. My technique slightly changes and becomes more refined with the more painting I do, which I feel ultimately enhances my art. 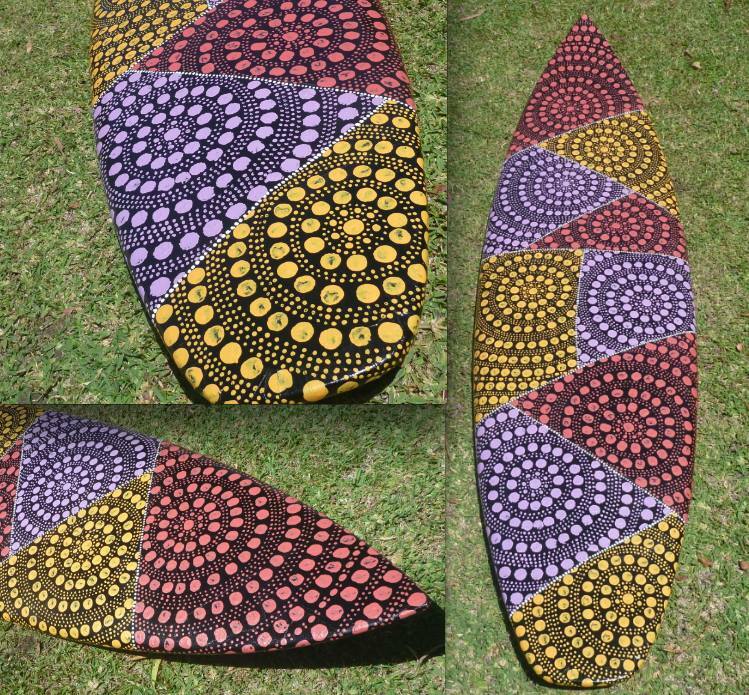 However in saying that the first surfboard I ever painted will always hold a special place as it was what sparked my interest for combining my surf and Indigenous cultures together. Thanks so much for speaking with us Zachary! Check out more of his work here.